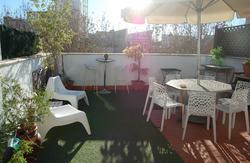 Traveler's inn has spacious communal areas, spacious modern kitchen facilities, a rooftop and terrace with fantastic views of seville where you can enjoy a beer or sunbathe in the heart of one of seville's most vibrant neighbourhoods (alfalfa). Whether you want to head out to the alcazar, casa de pilatos, archive of the indies or wander through the mass of palaces and parks, you are just minutes walk from everywhere you want to be. 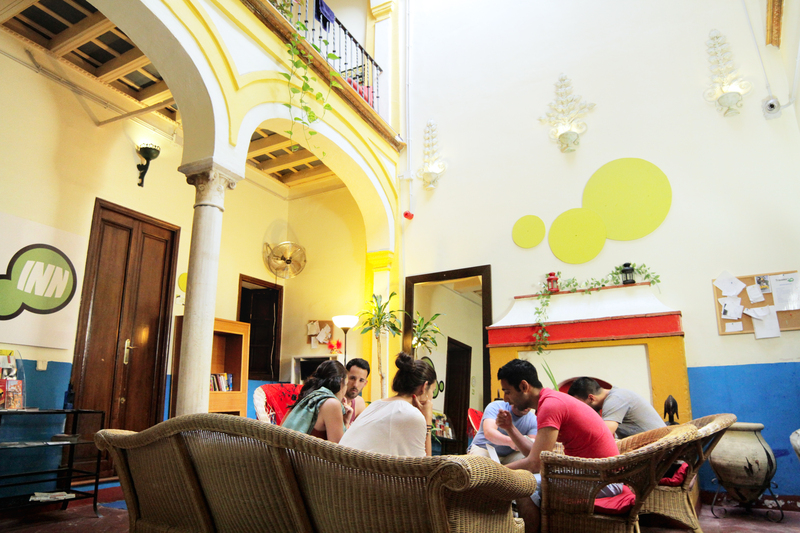 There is free internet terminals and wi-fi, a lot of activities, cold drinks, free coffee and tea and much more! Below are walking directions to our hostel from all arrival locations. 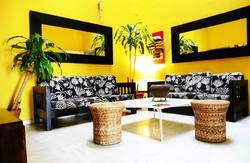 We are located at Calle Augusto Plasencia in the old historic city centre of Seville. This big city centre is full of small and curved one way streets that make the public transportation very difficult. So, we suggest you take a taxi and ask them to take you to Iglesia San Isidoro. When you arrive at the church, you should easily see our street. Only a few steps into Augusto Plasencia the street narrows. At this narrowing is where our hostel is located. Look for the white building sticking out of the street with the yellow trim. There is a small tile of a crown above the big wooden doors. On the doors you will see our sign. If you choose to walk the instructions above or follow your own and at any time get lost, ask people for Iglesia San Isidoro and find out street at its corner or ask for Cuesta Rosario which is the street that turns into Augusto Plasencia (our street). *Please note there are 2 bus stations in Seville. Know which one you arrive at! Upon exiting the main doors, the main road to the left is Avenida de Carlos V. From Av. De Carlos V, take the Metro centro tram to Plaza Nueva (it is the last stop). If you wish to walk 10-15 minutes instead of taking the tram you can just walk along the tram line and arrive at Plaza Nueva by foot. From Plaza Nueva walk behind the big city hall (Ayuntamiento) to Plaza San Francisco. From Plaza San Francisco, walk up Francisco Bruna Street (which is on the opposite side of banco de Espana, between the ABC newsstand and a big red building). Follow Francisco Bruna as it winds into the Plaza del Salvador. From here, the street name becomes Villegas. Continue up Villegas (keeping the big red faced church on your left) for a few short blocks until it becomes Augusto Plasencia. Continuing straight, only a few steps into Augusto Plasencia the street narrows. At this narrowing is where our hostel is located. Look for the white building sticking out of the street with the yellow trim. There is a small tile of a crown above the big wooden doors. On the doors you will see our sign. Get on the airbus to Prado de San Sebastian (Seville), once you arrive there follow the instructions listed above from Prado de San Sebastian to arrive at our hostel. Take the airbus to Seville (It will take more or less 45min), get off in Prado San Sebastians bus station. 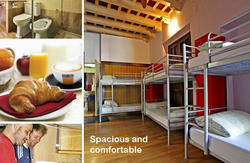 Once you arrive there follow the instructions listed above from Prado de San Sebastian to arrive at our hostel. Upon exiting from the bus station walk down Av Toreno keeping the bus station to your left. At the end of the bus station turn right onto Calle de Alfonso XII after a kilometres you will see the (second) big Cajasol on your left, there you must turn right into Calle Cuna. Continue down Cuna until you arrive at Plaza del Salvador with the big red church. At the end of Plaza del Salvador turn left up the street called Villegas. Continue up Villegas for a few short blocks until it becomes Augusto Plasencia. Continuing straight, only a few steps into Augusto Plasencia the street narrows. At this narrowing is where the hostel is located. Look for the white building sticking out of the street with the yellow trim. There is a small tile of a crown above the big wooden doors. On the doors you will see our sign. Use Caution this route is missing sidewalks and pedestrian paths.